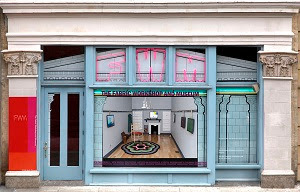 The Fabric Workshop and Museum, founded in 1977, is recognized as an internationally acclaimed contemporary art museum and is the only institution in the Unites States devoted to creating work in new materials and media in collaboration with artists at all stages of their careers, working with studio staff, educators, and apprentices. Photography and Video Archives documentation of the creative process of artist's residencies, artist and curator lectures, exhibitions, special fabrication techniques, and educational activities. The Artist-in-Residence Program a collaborative process, a permanent collection of some 6,000 works of art and an archive of diverse materials that preserves and documents the course of artistic production from inspiration to realization. FWM hosts emerging and established local and international contemporary artists who have a demonstrated commitment to innovation and exploration. 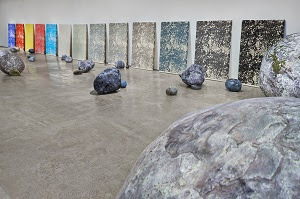 Artists-in-residence are drawn from all disciplines, including painting, sculpture, architecture and design, conceptual and installation art, performance, and video. Working collaboratively with FWM's staff of printers and technicians, artists are introduced to new techniques, materials, and resources, and are thus able to realize projects that would not otherwise be possible. Through this collaborative creative process, artists stretch the boundaries not only of their own work, and of the creative possibility of the various media, but also of the larger development of contemporary art. High School one of the original programs of The Fabric Workshop and Museum, the High School Apprentice Training Program offers students the opportunity to learn all aspects of hand screen-printing on fabric. Students design and print their own fabric yardage and assist staff in the production of artist residency projects. Hand screen-printing is an art form as well as an industrial skill, and the program is designed to provide students with new tools for artistic expression and self-empowerment. The program was created to provide excellent art education for teenagers from diverse economic and cultural backgrounds; the objective is to complement school resources and improve art education for high school age students in the Philadelphia region. College and Post-Graduate a holistic experience enabling artists to develop skills in silkscreen printing and working with fabric to enhance their studio practice. Apprentices participate in the daily operations of the FWM studio and museum and learn how to create a design by hand on mylar, mix colors with fabric pigment, use screen printing techniques, register multiple screens, and print their own one-color and three-color repeat yardages. The program focuses on enabling artists to develop skills in screen printing and integrating fabric into their art making. 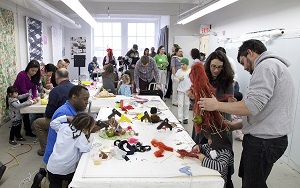 Family Programs designed to explore and learn about contemporary art in new and exciting ways. Using FWM's exhibitions and unique studio environment as a foundation for learning, this program features hands-on activities designed to spark interest, arouse curiosity, and encourage children and adults to learn about art and culture together. Workshops allow families time and space to share in the creative process and expression inside and outside the Museum walls. Study Tours Workshops and Custom Programs lead participants through our current exhibitions and professional studios and are available to middle school, high school, college and adult groups. Custom programs include one or two-session collaborative design and print repeat yardage workshops or special presentations of past artist-in-residence projects. 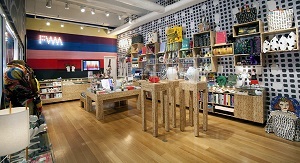 Museum features include an ambitious exhibitions program, a museum shop filled with functional objects created by artists-in-residence, FWM publications, onsite screen-printing and studio workshops and a wide ranging educational program. The Fabric Workshop and Museum is in the heart of a thriving community in Center City Philadelphia’s Convention Center District, home to cutting-edge art galleries and a historic art academy.